This sub-tropical shrub is used extensively in low-elevation zones for its extravagant, showy flowers and its incredible heat tolerance. Red Bird of Paradise is a rounded, open shrub with light green, feathery, compound leaves. The inch-wide flowers have slightly ruffled petals that are a deep orange color with varying amounts of yellow. Some forms of Caesalpinia pulcherrima have pure yellow flowers. Although this shrub loses most of its leaves in the winter, it recovers quickly. Plant red bird of paradise shrub in full sunlight after all danger of frost is past. This shrub tolerates any well-drained soil including rocky, native soils. It does not do well in heavy clay soils. Apply slow-release or organic fertilizer annually in spring. 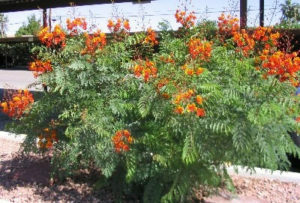 Water established red bird of paradise shrubs every four to seven days in the summer. Water once a month in the winter, or rely on natural rainfall. Other Features: Showy summer color. Attracts butterflies and hummingbirds.